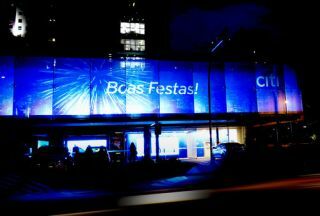 Christie announced that Citibank’s flagship branch Nova Faria Lima in São Paulo, Brazil, has installed 19 Christie GS Series laser phosphor projectors to create a 250 square meters permanent projection in its glass façade, which is the biggest rear-projection mapping in Latin America. The installation has been carried out by Founders, a Brazilian company that is part of the JChebly group. The office, located in the area of Faria Lima Avenue in São Paulo, is one of Citibank’s most advanced branch outlets in the world. To celebrate the bank’s 100th anniversary in Brazil, Founders was given the mission to turn this branch into a digital landmark in the heart of the city. One of the biggest cities in the world, São Paulo banned all billboards in 2007 to fight what it saw as the growing problem of “visual pollution.” As a result, Citibank, Founders and Christie came up with a project to produce a new billboard concept approved by the Clean City Law, making it the only billboard in town. The installation was the result of teamwork involving several technicians from Founders and Christie, including André Nuvens Ingnez and Daniel Monteiro Pereira, Channel Sales Manager and Sales Manager Business Products respectively for Christie Brazil. The 19 Christie DWX555-GS laser phosphor projectors with 1DLP technology were installed at the façade of the office in a rear-projection set-up, producing a 100,000 lumen projection mapping over the glass façade and the laterals of the office, covering an area of 250 square meters. The 24/7 projection is a permanent source of information, entertainment and culture where media artists, poets and designers are invited to create unique digital contents stating their views, opinions and love for São Paulo. In doing so it has emerged as a powerful platform that connects the city and its citizens. “We needed very powerful projectors to offer the best quality image, and that’s why Christie DWX555-GS projectors served us perfectly,” said Chebly. Featuring laser phosphor illumination and equipped with 1280 x 800 WXGA resolution, the Christie DWX555-GS eliminates the need for lamp and filter replacements, providing 5,400 ANSI lumens and 20,000 hours of low-cost operation with a small footprint, low-weight, quiet operation and a full suite of lenses.